We are still in galaxy season 🙂 So I have chosen another galaxy for this month’s “Image of the Month”. This time, what I consider to be the most beautiful face-on spiral galaxy in the northern hemisphere – Messier 101 (NGC5457, Arp26, UGC8981, PGC50063) also called the Pinwheel galaxy (bit confusing as M33 is also called the Pinwheel galaxy). Although this is relatively bright at magnitude 8.3 (O’Meara says 7.9) and it always seems to be nice and bright on the monitor as the subs come down, the end result after stacking is often pretty disappointing as the surface brightness of this object is pretty low. This of course means you need to take both long subs and as many of them as you can get. 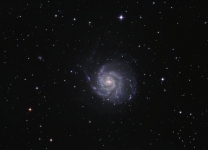 If you are working at f#4.5 with a 90mm refractor the minimum sub length you want to go for is around 10-minutes, and you will want around 50 of these to play with so we are talking in excess of 8-hours for a decent M101 image – but it’s got to be worth it. A lovely Arp spiral with a whole bunch of galaxies lying nearby in this region of Ursa Major. At a distance of 17.5 million light-years M101 is quite large with dimensions of 28.8 x 26.9 minutes of arc. Whether you work at long focal length, or take a wide field image of this region to capture all the close-lying faint fuzzies, M101 and its surroundings are well worth your valuable imaging time as a record of this busy area of sky. Until next month – clear skies! !